Over the past week we’ve looked at the Engineers’ schedule, broken down the teams they’ll face, and opined on some of the strengths and weaknesses of the ECAC opposition. Let’s take a moment to wrap it up with a look at the preseason Coaches’ Poll and our own predictions for the ECAC this season. Below is a chart showing the league’s final standings from the past five seasons, along with the preseason poll results. Taking a look at the poll and based on our review of the league’s members, there’s not much to disagree with in the coaches’ predictions. As is pretty typical of preseason polls, the coaches followed last season’s results fairly closely. Cornell and Clarkson are clear favorites to take the top two spots, with Harvard and Quinnipiac close behind. Either of the Crimson or the Bobcats could move up if they get a strong performance from their goaltenders. St. Lawrence, Princeton, RPI, and Dartmouth are good picks to round out the playoff spots, but in what order is anybody’s guess. After the trouble Dartmouth had last season, it’s possible they could miss the playoffs for the second year in a row, something most would have considered unfathomable just a couple seasons ago. The coaches’ prediction of Princeton finishing in 6th could actually be a little on the low side as long as the Tigers’ upperclassmen come back stronger than last season. Experience will work in their favor in 2010-11. RPI, picked 7th, we feel to be pretty accurate. With a lot of talent to replace and a heavy dependence on some upperclassmen who did not have spectacular seasons last year, the Engineers could find themselves out of the playoffs just as easily as they could be in the top half of the league. A lot will depend on the performance of Sonja van der Bliek in net. Rounding out the bottom of the conference are Colgate, Yale, Brown, and Union, four fairly safe picks to miss the playoffs again in 2010-11. While Brown and Union can pretty much be considered locks to finish 11th and 12th, Colgate and Yale could play spoiler to one of the teams picked to finish 5th-8th. Of Colgate and Yale, the Bulldogs look more likely to be the surprise team to climb out of the bottom third, with returning talent and goaltending that look a little stronger than the Raiders bring to the table. Looking back a couple seasons in the final standings, it’s fairly obvious that last season’s results represented a big shakeup compared to the typical results of seasons past. 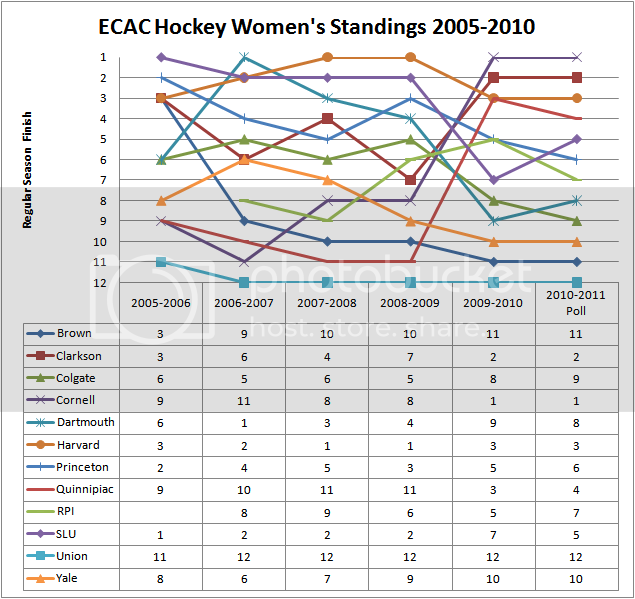 This season’s results could give a better indication of whether that shakeup was a fluke, or if years of fairly uniform results could be out the window in favor of a new arrangement where Cornell, Clarkson, and Quinnipiac find themselves in the spotlight while Dartmouth and St. Lawrence struggle in the bottom half of the standings. The ECAC schedule kicks off October 29th and 30th. In the meantime, we’ll be keeping an eye on these teams during nonconference play in order to get a better feel for what to expect once we get into league play. To catch a glimpse of the Engineers as they take to the ice for the first time this season, make your way to the Field House this Saturday at 4pm following the RPI-WPI football game for the team’s exhibition against the University of Montreal.